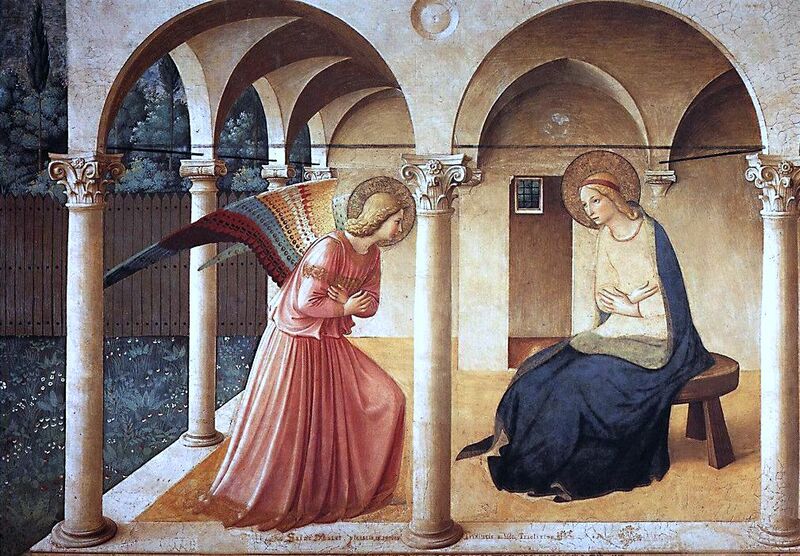 Here is a great piece of catechesis on the importance of Mary in the Church. I found this useful not just for the content - the vital role of Mary is explained clearly and in-depth in just 30 minutes - but also as a model of how to communicate this to others. Relying on Scripture and the Church Fathers, the explanations as to why we believe what we believe could be understood just as easily by atheists and believers of other faiths, as by Christians from other churches. It is an interview given recently by Fr Sebastian Carnazzo on Arab-American TV. Fr Carnazzo, pastor of St Elias Melkite Church in Los Gatos, California, is on the faculty of Pontifex University, and taught for several years prior to that at the Priestly Fraternity of St Peter’s seminary in Nebraska. To draw one detail from this: in the light (if you’ll forgive the pun) of Fr Sebastian’s description, we can understand the emphasis on the strong shadow behind Mary which Fra Angelico puts in this painting of the Annunciation. Note how the Archangel Gabriel is not overshadowed in the same way, even though Mary is holier than the angels, and will be shining with the uncreated light. This arises from the gospel of Luke’s statement that Holy Spirit “overshadows“ ” Mary; this echoes the language of the Old Testament, which uses the same word to describe the place where God’s glory rests on the Ark of the Covenant. (References to the Ark of the Covenant then connect to those in the Book of Revelation). If you want to see the role of Mary in the wider culture after watching this, you might want to read The Marian Option - God’s Solution to a Civilization in Crisis, by another Pontifex University faculty member, Dr Carrie Gress.